Procurement organizations have a choice of transforming themselves or watching other enterprise organizations assume the responsibility for sourcing the technology that supports key business initiatives. In this IDC web conference, we will identify the top challenges identified by Procurement, IT, and LOB executives, and discuss strategies for transforming procurement organizations from tactical administrative centers to strategic sourcing partners for the enterprise. Many enterprises and their IT teams continue to struggle with the accelerating pace of change being brought about by the new digital technologies, business model innovation and increased competitive tempo. This challenge is more than “change management”; this is a broader problem – a need to accelerate organization transformation and evolve cultural norms. During this IDC web conference, our analysts will share both cultural frameworks and specific, tangible tactics for executive IT leaders, noted within our research, that have been found to power IT’s broader organizational transformation. Digital transformation presents an opportunity for established organizations to make significant changes to their businesses and operations through new technologies — creating improved and even disruptive business outcomes. Once these digital transformation objectives have been established, success metrics and key performance indicators (KPIs) can guide the path to measuring performance and investments effectively. Traditional metrics (e.g., revenues, cost efficiencies) are no longer enough and must be blended with new metrics that can measure the short and long-term impact of management’s transformation investment decisions. A recent IDC survey showed that 85% of U.S. companies have undertaken rationalization and modernization, but only 35% are achieving success in their efforts. How can organizations tackle this rationalization and modernization challenge? This web conference addresses the fact that digital businesses require technology modernization to sustain digital transformation. You will also take away how to deal with one of IT's greatest challenges -- coping with the sprawl of innovative new technology implementations initiated by business units, and rationalizing legacy while containing cloud sprawl. Cloud sprawl is one of the top three challenges faced by CIOs, with over 90% of enterprises impacted. The simplicity of spinning up a new SaaS application in the cloud has emboldened LOBs to go solo. Enterprise LOBs, eager to transform their operations, are rushing to implement cloud-based SaaS solutions, often without support from IT. Unfortunately, with each implementation, technical debt accumulates. Although initial pilot costs may be minimal, as applications begin to scale, their financial impact becomes significant. In the face of this complex set of challenges, it falls to IT executives to keep cloud sprawl from casting a dark shadow on the enterprise. No enterprise can be completely secure, and in the uncertainty that necessarily permeates the landscape, others will find fault. This web conference provides a way for CIOs to use proven scientific and economic principles to enhance their organizations’ security position. Simply put, the most effective security programs reduce the most risk with the least resources; therefore, an organization must find a way to measure the efficacy of its security program to understand how much of the risk it is reducing after it applies security controls. With the appropriate key risk indicator (KRI) data collected, organizations can determine which initiatives are ultimately the most useful in their security program. New digital technologies and business strategies are changing the fabric of our organization's products, services and customer engagement models. In turn, these changes have redefined the CIO's role with the Board, with their Peers and with their Teams – creating a mandate for CIO's to consciously rethink their communication strategies, tactics and methods. This session provides three unique communication frameworks for CIO's to guide their communication with the Board, their enterprise Peers and their Teams. Watch this video to understand where IT and business leaders are being challenged in their digital transformation journey and key ways to take on the challenges. This IDC web conference provides a step-by-step guide to creating a successful data management initiative. Data investments and costs are skyrocketing as data volume, variety, and velocity grow exponentially; at the same time, siloed data initiatives and lack of deep expertise are limiting outcomes and speed. As a result, waste and complexity are growing exponentially, and many companies are being left behind the competition. Companies need an iterative approach to addressing the challenges that organizations face as they spool up their data management capabilities. 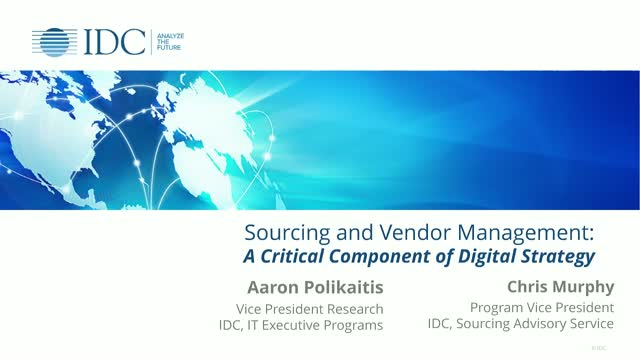 Learn what research coverage from IDC is available for CIOs and IT Executives that are leading their teams through digital transformation. By 2022, IDC forecasts that 80% of enterprise revenue growth will depend directly on digital offerings and operations. To benefit from this growth opportunity, IT and business leaders of the enterprise must prepare by building up the correct capabilities. During this session, you will learn new IT capabilities (processes, platforms, talent, governance) needed for digital transformation, and walk away with the three critical digital strategies many organizations are pursuing: experiential engagement, data monetization, and digital business at scale. • What technology management strategies and practices should IT organizations adopt as digital business capabilities are requested by the various business units? • What is a technology capability, and how is it different than IT's existing implementation models? • How should CIOs and technology leaders begin their own technology capabilities journey? Digital business requires a solid grasp of what’s working well and what’s not: for IT leaders, metrics demonstrate the value of their contributions. But in the hyper-competitive world of digital transformation, we know that traditional performance indicators don’t serve organizations well. Companies must develop a new approach to metrics that enables them to quantify value, remain competitive in the marketplace, and prepare for the future. This web conference empowers you to exploit metrics to accelerate your organization’s digital success. • What are some new ways to accelerate and measure the effectiveness of digital transformation initiatives? • How will IT economics and metrics help drive new digital transformation-oriented business models? • How can new digital transformation KPIs demonstrate and communicate IT’s unique competitive value to the enterprise? • How can spending and IT metrics increase alignment of IT budgeting with business imperatives? The challenge for IT executives and their organizations is two-fold: first, to continue to operate IT’s existing systems of record at extraordinary levels of reliability; and second, to support business units with new innovation initiatives as they respond to insistent threats and opportunities in the marketplace. This web conference focuses on the second part of IT’s challenge. Drawing on interviews with CIOs and recent survey data, it shares specific practices that enable IT leaders and their IT organization to execute on their company’s digital innovation strategy. • How should business and IT leaders identify their goals for innovation? • How should IT leaders support the right initiatives and people? • How can leaders optimize innovation spending through the use of metrics? • How can IT work with start-ups to achieve innovation objectives?